I was working yesterday afternoon and so while I had the teevee tuned to the fourth round of the Masters I wasn’t paying especially close attention to it. Besides, defending champion Jordan Spieth was up by five strokes with just the back nine to go, so it didn’t seem like there’d be that much drama in store as the tournament wound toward its conclusion. That means I didn’t quite live through the moment-by-moment agony of Spieth’s 12th hole, the par 3 that he quadruple-bogeyed. I looked up and saw he was strangely and suddenly down by three strokes, then caught up a bit to discover more details of what had happened. Perhaps it was because of my casual viewing, but I didn’t anticipate how the pundits today would characterize that hole and Spieth’s overall “collapse” as “the most shocking in golf history.” Part of me wants to react by talking about recency bias and hyperbole, although like I say I wasn’t as tuned in to the proceedings as many others were, nor do I have a command of all of golf history to provide me the needed authority to counter such a claim. I do remember Rory McIlroy’s less sudden but no less affecting “collapse” five years ago when he led the Masters heading into the back nine only to finish in a tie for 15th. As I wrote about here then, McIlroy’s fall was perhaps easier for many of us to identify with than what happened with Spieth yesterday, given Spieth’s utter dominance over the previous seven-and-a-half rounds’ worth of Masters golf. The lightning-bolt quality of Spieth’s single-hole nightmare also made it seem like too much of an aberration to recognize and empathize with as it was happening. Thinking again about the different ways players lose at poker, I guess Spieth’s “one really, really bad hand” probably happens a little less often to us than does the gradual series of small mistakes and lack of focus McIlroy demonstrated on his ill-fated back nine in 2011. It happens sometimes, say, in a tournament, where one especially poor decision overwhelmingly determines a player’s fate, bringing on elimination either right there and then or shortly thereafter. But usually it’s not so simple to pinpoint precisely where it all goes wrong. In poker I think it is easier to come back from the one really bad hand where one can focus on a particular error or misjudgment and correct it going forward. It’s a little less simple to overcome the bad habits and overall skill deficiencies that often lead to more gradual slides out of tournaments or to the felt in a cash game. Not sure it’s quite the same in golf or other sports, though. Thinking back, McIlroy did come back to win the U.S. Open -- the very next major -- just a couple of months after that Masters five years ago. Which variety of losing is easier to correct and/or overcome? 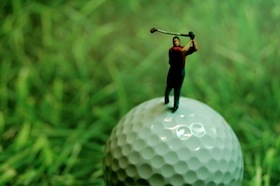 Photo: “Golf ‘Lessen’,” JD Hancock. CC BY 2.0.